Hereford picked up another victory at Hitchin Town last night, increasing the Bulls points total to an impressive 110, and another Southern League Premier Division record. Simon Wright battled through the traffic and adverse weather conditions and made it to Top Field. “Its b**** cold” wailed Mrs W, despite sporting a heavy coat plus my gloves and hat. In truth, the weather wasn’t really that bad, though equally not as mild as you might expect for the last week of the season. There was no warming the Boss up that night or the following morning. Low temperatures were maybe just one of many reasons for Hereford supporters not to travel. Some like myself had highly unpleasant memories of previous visits to Top Field. Biggest barrier of all was how to justify another long midweek trip when the Shield was already secured. The turnout was probably the lowest for any League game and those that did show were mainly Southern Exiles – from places like Peterborough, Mk or Aylesbury. Plus, Ramsgate’s finest Mark Nottingham who shared some refreshing angles on the North v South debate. Good to see you all guys. Impossible to estimate our numbers. For me, I’d be surprised if we raised 100. To demonstrate empathy we drove from north Herefordshire. 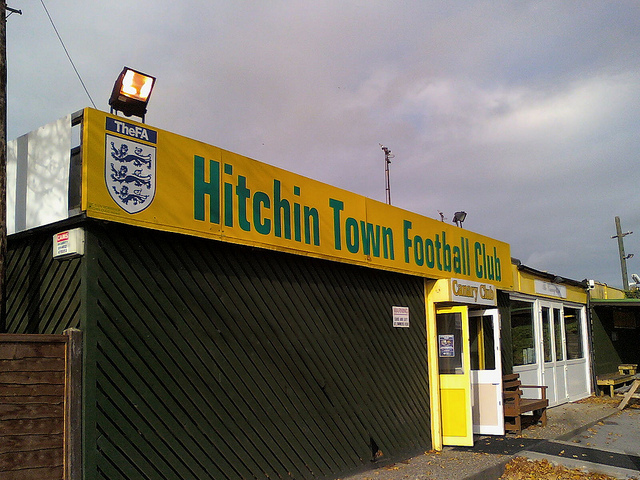 Hitchin is a bit different with its ancient ground, wooden terracing and generally laidback people. Most impressed with the old programme and bookshop, a rarity indeed. This is an unchallenging, pleasant place to watch football. I detected no resonances of the infamous FA Cup game. Decent of Hitchin to reserve us a blue badge car parking space 4 times and pleasant to finally take it up. Manoevering into the space led me to share road with some of our players, who looked a little concerned. Sorry Big Jack. I did see you, honest. The Canary Club bar wasn’t what I expected for a 7 day a week operation. This was a small, not unwelcoming Sports Bar meets working mens club. Real ale was certainly WMC priced. Hitchin’s 3 home games in 5 days meant a treble programme, weary volunteers and a reshuffle of the home squad, so much so Hitchin regulars couldn’t recognise some of their own. Hereford had reshuffled too, though our team was instantly recognisable. No scratch side here. JB had a rare chance to shine and he took it fully, neatly setting up the first goal. After that, leg weary Hitchin threatened only occasionally but Will Puddy was equal to everything. Thankfully, having twin powder-kegs Ryan Green and Brett Donnelly coming up against each other did not lead to fisticuffs. Donnelly missed a one on one chance but otherwise just looked tired and old. I do understand that feeling. Our gaffer was right. Ryan Green was class tonight. He was always first to the ball while his passing was first class. Our team made a fulsome effort tonight. Lesser sides would have gone through the motions. The natives were generous in their appreciation of the Boys, now a remarkable 13 points ahead of Kings Lynn. “Best team we’ve seen”. This was our fourth visit to Hitchin and the first time a Hereford team has won. Of course, the generosity didn’t extend to the 50-50. I was predictably the usual few numbers out. Again. Next up… Dunstable v Gosport. Talk about one end to the other.